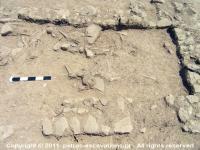 The excavation at the plot which lies on the north sloped of Petras-Kephala (Hill II) continued in 2006. The excavation began in 2004, under the direction of Metaxia Tsipopoulou and the participation of the archaeologist Dr Yiannis Papadatos, and it was focused on the west slope of the higher terrace. Three burial buildings came to light, that had more than one architectural phases. 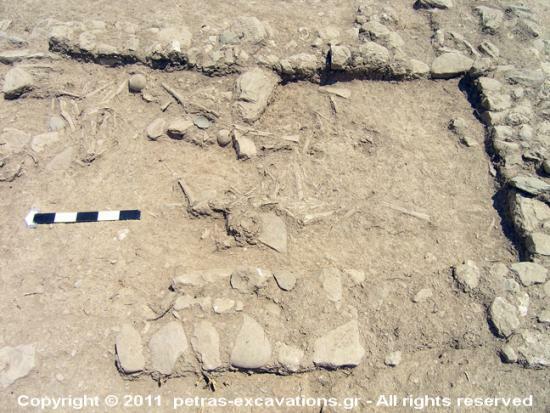 It was established that the Petras Cemetery was an extensive nekropolis containing a large number of House Tombs dating to Prepalatial and the beginning of Protopalatial period. A rock shelter, part of the EM cemetery of Petras, was investigated on the southwest slope of Hill II at the adjacent plot. It contained large amounts of osteological material, such as 102 skulls, and movable finds (EMI-MMIA) of great importance both for their quality and the historical value (pottery, jewelry and seals). The rock shelter was used for secondary burials. It is possible that the deposition followed the cleaning of a particular House Tomb. It was established that the rock shelter was reused in Neopalatial period when a ceremonial LM I jug and a conical cup were deposited, almost on the surface.